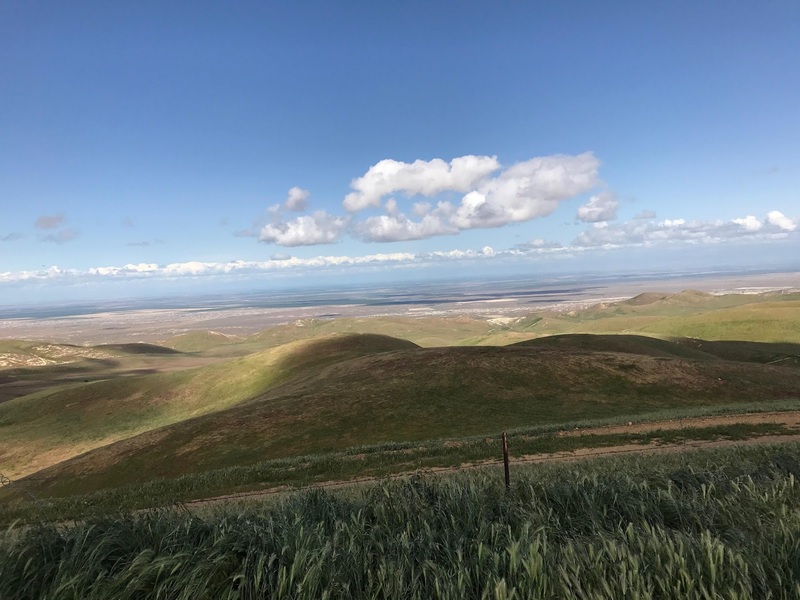 Musings from a 40 something, single woman exploring North America in a Motor home .. one mile at a time. 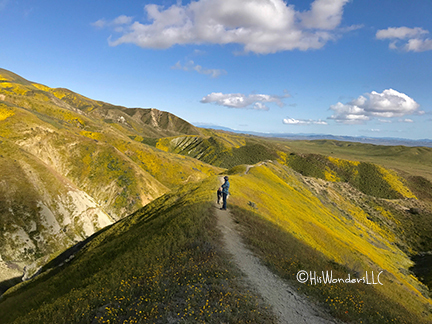 Carrizo Plains Super Bloom 2017! If you are into wildflowers, you know that a super bloom at Carrizo Plains is huge! Seeing central California’s Carrizo Plains National Monument in bloom has been on my Bucket list for years. 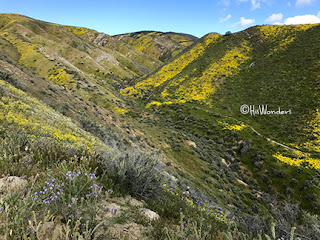 Drought & proximity have been the problem in past years but with a super bloom this year, I made a 15 hour trek to see the bloom. It was past peak in many areas but I was not disappointed! 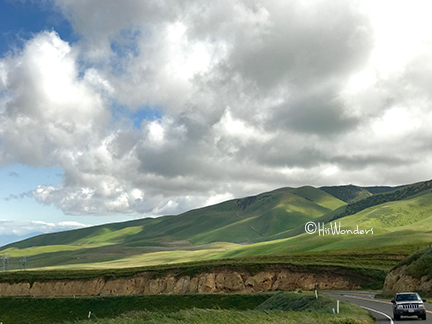 I had trouble finding the Hurricane / Crocker Springs Road thru the Temblor range on the east side. Stopped a guy in a Jeep in the area of the petro facilities outside of Taft but sadly his directions lead me to the paved entry via CA-33 /CA-58. 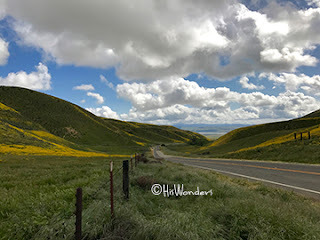 I really wanted to go thru the Temblor mountain 4wd road but I certainly was not disappointed on the paved route as winding up the green hills on CA-58 then looking over the San Joaquin valley & descending again with yellows on both sides of the road. It was absolutely beautiful! 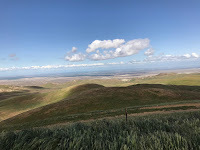 After I returned back, the day was waning & I opted to head back down to Simmler road and cross over the plain to Soda Lake road. 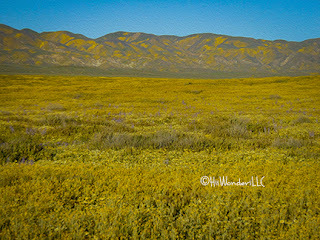 The flowers here were knee high, abundant and beautiful even though they were past peak. I was able to stop and get a couple of pics at Soda Lakes before the sun dropped behind the hills. The glimmer of the yellows at twilight on the trip over 7 Mile Rd and up CA-58 and the lights of the valley capped a fine first trip to this National Monument! 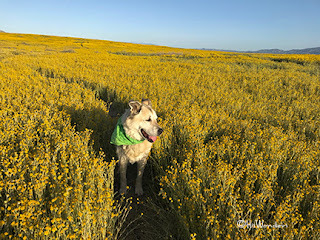 Golda the Adventure Dog enjoying the Super bloom! Notes: The TheodorePayne.org flower hotline suggested that Elkhorn road required a high clearance vehicle. The roads were dry on my visit and all of the sections that I drove on were easily accessible by passenger cars. Full-time RVer for a decade. Living one mile at a time .. enjoying nature, walks with the dog, taking pictures, along with trying to help non-profits make the world a better place along the way. 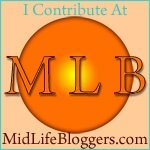 My first post (Aug 2008) on my MidLife on Wheels blog explains how I started this journey. 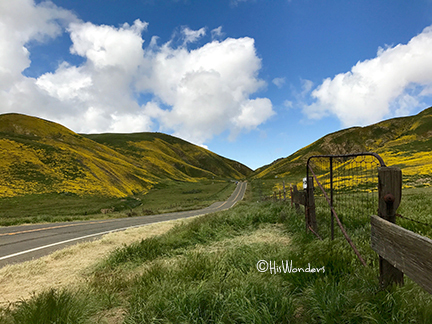 My Unpaved Roads Less Traveled blog highlights scenic off-road drives you can do in a passenger car. 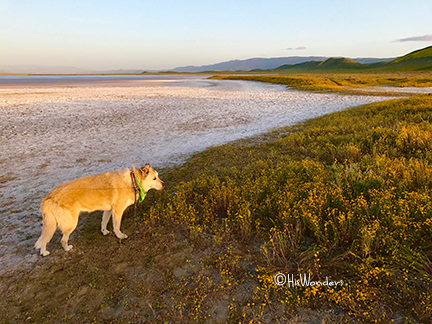 You can find me on Instagram at @on_daroad & Dog's Facebook Page is Facebook.com/GoldatheAdventureDog, please give her a Like! 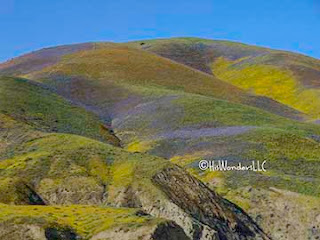 Check out www.HisWonders.com for great nature based gifts! Mexico for the Third Time this Year! FREE copy of Tetterbaum's Truth!